Race the penguin. Go Lukas Go! Photo by Kevin Ticen. It’s another Sunday morning and the animals are getting a little restless in my house. Luckily for me, spring is in full bloom so the weather is starting to turn nice and, really, how many times can your kids watch Cars in a day. 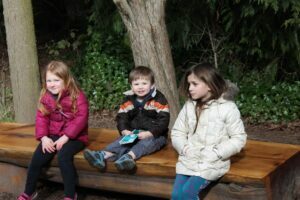 On this Sunday, it’s time to pack them up and head to one of our favorite spots, the Woodland Park Zoo.In our house, our zoo membership is one of our prized possessions. We take the animals to Woodland Park at least once a month and always visit the zoo when we travel with our kids. Zoo membership comes with reciprocity to more than 150 zoos and aquariums nationally, making our trip to the zoo the most cost effective thing we do when travelling. For the full list of reciprocal zoos participating in the membership program see HERE. At Woodland Park Zoo, there are two main entrances and parking areas. Today, we start at the south entrance so we can begin at the African Savanna, but the newly remodeled west entrance has significant parking and the great penguin exhibit. This trip, however, is a special one as it will be our first to see the lion cubs, born in November and only recently on display. 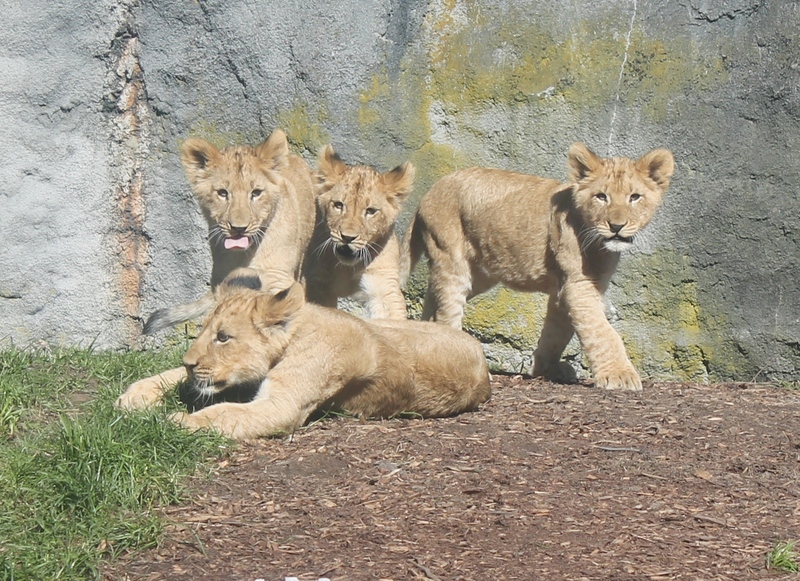 There are four lion cubs, two male and two female, that are now five months old and already 50 pounds. 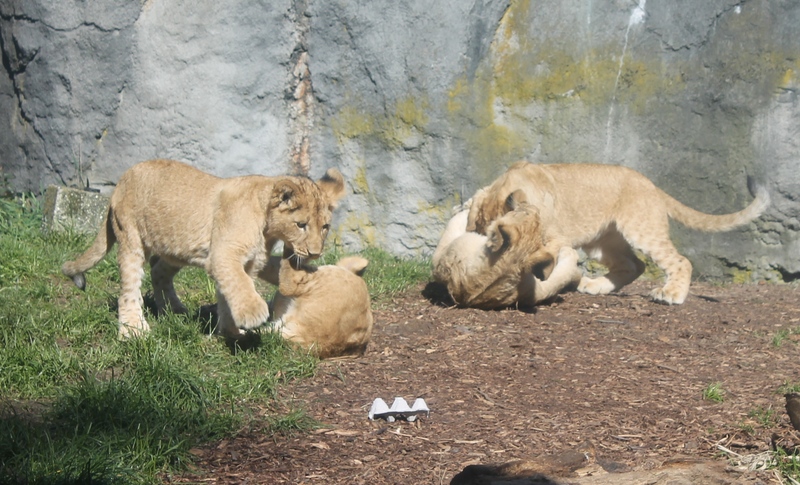 Although the zoo opens at 9 a.m., the lion cubs usually don’t hit their den until 10 a.m. and it is weather dependent so make sure to plan accordingly. Game on! Photo by Kevin Ticen. We got there a few minutes before 10 a.m. so we could see them enter their den. The experience did not disappoint as they came out with more energy than my kids (I previously did not think that was possible) and played right in front of us. We all had a great time watching! In the Talga Viewing Shelter, getting to meet the bears up close and personal. Photo by Kevin Ticen. We love the zoo because our kids can run and burn off energy while getting to experience nature. 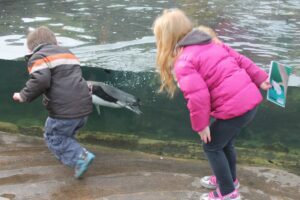 Whether it is seeing the giraffes at feeding time, the tigers roaming their cage, or a bear jumping in to the water to grab a fish mere inches away from my daughter, there is so much to see at Woodland Park that we get a different experience each visit. 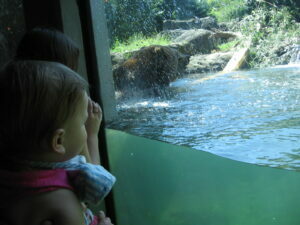 And yes, the experience with the bear really happened when my oldest daughter was only three. Luckily, those few inches were occupied by thick glass and it was an incredible sight for all of us to see. Break time. There are plenty of great places at Woodland Park Zoo to stop and take a rest. Photo by Kevin Ticen. The staff members at the Woodland Park Zoo are always friendly and helpful (how do you think I knew the lion cubs were already 50 pounds?) and it is easily accessible by car or bus. So, when the animals get restless in your world, pack your chocolate milk and camera and get them ready for a great trip to the Woodland Park Zoo.